A short explanation of anarcho-syndicalism and notes on its history. Anarcho-syndicalism is one of the major forms of social anarchism. The idea behind anarcho-syndicalism is to combine the economic methods of syndicalism with the revolutionary politics of anarchism. This leads anarcho-syndicalists to be involved in everything from small propaganda groups to mass revolutionary unions, always organised according to anarchist principles, on a decentralised, federated basis. Anarcho-syndicalism developed out of Revolutionary Syndicalism, however whereas Revolutionary Syndicalists rejected any politics in the union (in the 1906 Charter of Amiens), anarcho-syndicalists insisted that any organisation of workers must have explicitly revolutionary politics lest it lapse into reformism and collaboration with the ruling class. Following the Revolutionary Syndicalist CGT’s support for World War One, against the anarchist principle of international working class solidarity, the Spanish CNT voted in 1923 to adopt libertarian communism (anarchism) as its explicit goal. It is a noteworthy feature of the revolution that despite the rather small influence of Anarchists on the masses before its out break, it followed from its inception the anarchistic course of full decentralisation; the revolutionary bodies immediately pushed to the front by the course of revolution were Anarcho-Syndicalist in their essential character. These were of the kind which lend themselves as adequate instruments for the quickest realisation of the Anarchist ideal - Soviets, Factory Committees, peasant land committees and house committees, etc. At its foundation in 1922, the International Workers' Association (IWA) committed itself to "the establishment of economic communities and administrative organs run by the workers in the field and factories, forming a system of free councils without subordination to any authority or political party, bar none." In more recent times, the late 1980s saw the CNT organise mass assemblies in the workplace and community during the Puerto Real dockyard struggles. Another important element of anarcho-syndicalism is that it doesn’t limit itself to workplace activity, seeing tactics such as rent strikes and unemployed organising as means to further working class demands outside the workplace, alongside the more typically syndicalist direct action of strikes, occupations and sabotage by workers at the point of production. The aim of the anarcho-syndicalist union is not just to win improved conditions. It would also serve as "the elementary school of Socialism" (Rudolf Rocker, Anarchism and Anarcho-Syndicalism). In this way, anarcho-syndicalist unions aim to ‘create the new world in the shell of the old’ and they take very seriously Bakunin’s remark that the workers’ organisations must create "not only the ideas but also the facts of the future" in the pre-revolutionary period. The organisation of the union would prepare workers for the direct democracy, self-activity and mutual aid needed if the future society is to succeed. Anarcho-syndicalists, like all libertarian communists, "are convinced that a Socialist economic order cannot be created by the decrees and statutes of a government, but only by... the taking over of the management of all plants by the producers themselves" (Rocker, ibid.). Political parties are not just unnecessary for social change, but actually hold it back. These parties (even those claiming to represent the workers) stifle working class self-activity by attempting to either negotiate with government or by trying to lead the working class to victory. Anarcho-syndicalists believe that workers should take direct action to get better conditions at work and win social and political demands (while always having revolution and workers’ control as their final goal). An example of this would be the Spanish CNT (National Confederation of Labour) striking for the release of political prisoners in the beginning of the 20th Century, and British construction workers doing the same in the 1970s. Other recent political strikes include general strikes against the second Iraq war in Italy, Spain and Germany. Between 1905 and 1939, anarcho-syndicalism gained itself a very prominent position in the workers’ movements of France, Italy and Spain (the CNT playing a leading role in the Spanish Civil War and Revolution in 1936-39) as well as in Latin America where anarchism was the predominant force in the workers' movement in many countries (such as in Argentina, Brazil and, to some extent, Peru). Today, though not as powerful a force as it once was, it still plays a significant role in workers’ struggles in areas of Western Europe. Anarcho-syndicalism - reading guide - Libcom.org's reading guide on anarcho-syndicalism, its history and leading militants. What is the CNT? - CNT-AIT - English translation of ¿Qué es la CNT? introduction to the Spanish anarcho-syndicalist union. A history of anarcho-syndicalism - Solidarity Federation - Excellent 24 unit course on the history of anarcho-syndicalism and its influence on workers struggles around the world. Anarcho-syndicalism in the 20th Century - Vadim Damier - Superb critical study of anarcho-syndicalism - highly recommended. Anarcho-Syndicalism - Rudolf Rocker - Classic extended work of Rudolf Rocker on anarcho-syndicalism. 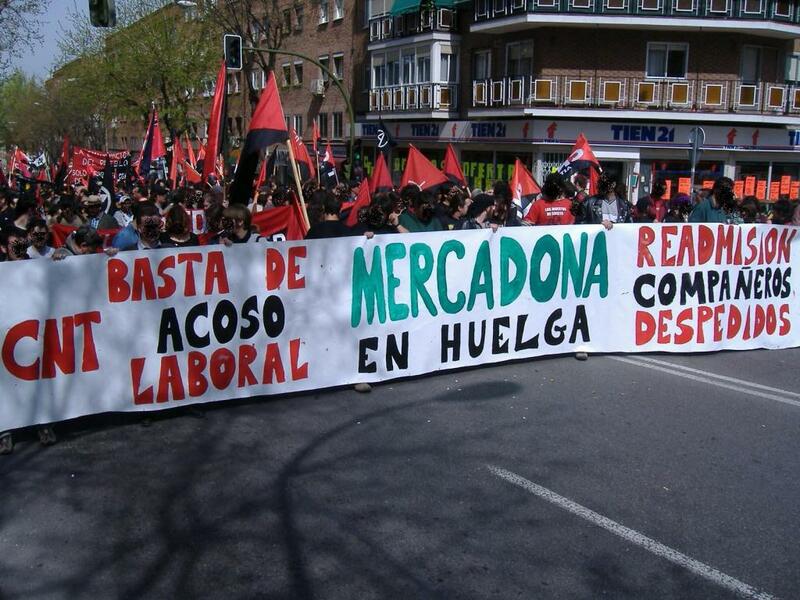 Revolutionary unionism in Latin America - the FORA in Argentina - Solidarity Federation - Excellent pamphlet on the development of the Argentinian workers' movement and the anarcho-syndicalist FORA. Spanish CNT striking for the release of political prisoners in the beginning of the 20th Century, and British construction workers doing the same in the 1970s. (Anarcho-Syndicalists) by no means rest content with the ideal of a future society without lordship; their efforts are also directed, even today, at restricting the activities of the state and blocking its influence in every department of social life wherever they see an opportunity. It is these tactics which mark off Anarcho-Syndicalist procedure from the aims and methods of the political labour parties, all of whose activities tend constantly to broaden the sphere of influence of the political power of the state and to extend it in ever increasing measure over the economic life of society. But by this, in the outcome, the way is merely prepared for an era of state capitalism, which according to all experience may be just the opposite of what Socialism is actually fighting for. Dunno about this, didn't the CNT have the aim of merging with the UGT? did anarcho-syndicalism begin and end in 1930s Spain? I didn't say that did I? But the text as written is inaccurate as far as the largest and best known anarcho-syndicalist organisation the world has even known is concerned. on what basis did the CNT want to merge with the UGT? was it a revolutionary anti-state programme? who was pushing this within the CNT, or was it a general sentiment? these are all honest questions, as i don't remember coming across much on this when reading about it. i only remember attempts at a rank-and-file revolutionary alliance. tbh this seems an innappropriate level of discussion for an introductory article. the present-day CNT certainly doesn't think that, nor does the IWA, the largest libertarian communist organisation in the world. So it just seems weird to hark back 75 years... i mean it's not really possible to speak of 'the CNT' in the 20s and 30s as it was wrought with internal divisions between 'straight syndicalists' and anarchists/anarcho-syndicalists, reformists and revolutionaries, collectivists and communists etc. I don't see why that bundle of contradictions should be taken as definitive 75 years later, especially when the very same organisation has long since re-emerged and resolved many of those contradictions? I suppose it depends if you want the article to be an introduction to anarcho-syndicalism or an introduction to one particular version of anarcho-syndicalism. You should make clear what you're doing though. well you seem to want it to be an introduction to a particular version that may or may not have existed in 1930s Spain, which you can't be bothered to provide evidence for despite some honest questions (seriously, i'm interested in the answers, you must be getting this from somewhere so please point me in the right direction). the article (aims to) reflect the vast majority of actual anarcho-syndicalist theory and practice. if you're convinced the CNT are that important, why not point me where in their 'what is the CNT' they say "every member of the working class must join our union"? JK, Libcom house rules clearly state that anarcho-syndicalism should be defined by it's detractors and not according to the bulk of theory and practice over the past 70 years. I am writing an intro to libertarian communism, but can't get much beyond "Murray Rothbard in charge of the USSR", can anyone help? i'm interested in the answers, you must be getting this from somewhere so please point me in the right direction). As I'm lacking in revolutionary literature at work you'll just have to wait, it will be sunday at the earliest before I can look anything up and even then I'm not promising anything, but as you're being so polite I'm sure you won't mind. I've never said that anarcho-syndicalism should be defined by its detractors. What I have said is that the article should be accurate. It's not my fault if the facts don't sit well with your views. It's not my fault if the facts don't sit well with your views. which facts? you've just asserted that anarcho-syndicalism is 'One Big Unionist' based on a half-remembered titbit about something that may or may not have been proposed (but never actually happened) 75 years ago in one country (or region of a country?). apparently this supersedes everything else that's happened in the tradition before and since and all current theory and practice of the IWA, the main anarcho-syndicalist organisation in the world. so if anyone's uncomfortable with 'the facts' not fitting their views, it would appear to be you. I've done nothing of the sort. I don't think nastyned picked an especially good argument with the CNT-UGT thing, but he is certainly correct in that this is an introduction to one particular version of anarcho-syndicalism. The CNT is a tool for struggle and for all of the working class. Who can belong to the CNT? Any worker can be affiliated to the Union, no matter its political ideas or religious beliefs. He/She just has to accept our associative pact, and respect the decisions taken by the assembly. The CNT calls itself revolutionary syndicalist because it is a fighting organisation both in the immediate present and with the prospect of overthrowing the State through armed revolution by means of a revolutionary general strike. Revolutionary, too, because through its own bodies located in the centres of production and its federal organisations such as the trade union and its agro-industrial cooperatives, it considers itself capable of taking over the tasks of production and of distribution after the revolution has taken place. Following a line which goes back to the days of the First International the CNT proclaims its complete independence of all political parties. The congress of 1918, so often referred to in this account laid down that 'professional politicians can never represent workers organisations, and the latter should make sure that they never affiliate themselves to any political club.' We have already seen that by its constitution the CNT must "fight in the purely economic field, untrammeled by any political or religious prejudice." Although any wage earner, whatever his political or religious notions, could belong to the CNT no one could represent it who had appeared as a candidate in any local or parliamentary elections, or who had accepted political undertakings. The idea of a single union for each industry ("One Union") was not invented by the 1918 congress. In the first workers' congress, that of June 1870, a form of organisation was adopted, which when perfected the following year at Valencia evoked the admiration of the internationalists who met in London that same year around Karl Marx (he will be mentioned again later). Let us note in passing that in every period of reorganisation after a spell more or less prolonged of suppression, the working class militant is faced with t the fragmentation resulting from different workers' groups in the same place of work, ironically called "chapels." This is to say that, in the same locality, there are to be found different groups of carpenters, or locksmiths, or smelters, run by little local "bosses" who defend their petty fiefs against the syndicalist organisation with cloak-and-dagger tactics. The "One Union" came to put an end to such gangster-chiefs. And in doing so, it ended their parochial quarrels and emphasised the unity of the working class. Further, the "One Union" carried the federalist enterprise to the furthest extent, spreading it throughout the region and the whole country. For all that, the One Union was already in existence in Barcelona before 1918. * The goal of organizing the world's workers for the defense of their immediate interests, and to obtain improvements in their quality of life. To form unions to achieve this. * The creation of a structure in which there are neither leaders nor executive power. * The desire for the radical transformation of society, a transformation to be brought about by the means of a Social Revolution. Without this goal of transformation, anarcho-syndicalism does not exist. Another name for anarcho-syndicalism is revolutionary syndicalism. The same congress also both proclaimed that the aim of the CNT was libertarian communism, and voted to provisionally affiliate to the "Red Trade Union Intenational" (which was linked to the Third Intenational). i think that's the crux of it. i really don't think that's true, and nor do serious studies like Vadim Damier's. a lot of stuff tries to conflate pretty much all syndicalism from the CGT onwards into a single amorphous mass, which i don't think is helpful on shedding any light on the evolution and debates within the tradition (Damier is good on this). but in any case, even the principle anarchist thinkers in the CGT - Pouget & Pataud - didn't aim to recruit every worker (though in a revolutionary strike wave they wanted to through open the union structure, transforming it into a federal structure for administering expropriated workplaces). the CNT's view is that you don't need to identify as an anarchist but you need to act like one, acting in accordance with their goals and methods. they're quite open that the CNT is animated by anarchist philosophy and aims at social revolution. and of course in splitting with the CGT(E) it clearly decided that it would trade membership for anarchist principles if necessary, and its practice has nothing to do with recruiting all workers, and everything to do with organising along anarcho-syndicalist lines. they welcome all workers who want to do so, but they're usually dwarfed by the mainstream unions. but the point is this is an introductory article, and i'm not aware of any contemporary anarcho-syndicalist groups that try and recruit as many workers as possible at the expense of their principles. hence "while anarcho-syndicalists advocate similar tactics to syndicalists, their revolutionary politics mean they don't aim to recruit all workers" seems like a straightforward description of dominant practice. if it was otherwise, why wouldn't the CNT just join the CGT(E)? The contempoary Spainsh CGT still describe themselves as anarcho-syndicalists. right, and the USSR still described itself as communist, the governments of Spain and Greece describe themselves as socialist. do words mean anything, or do we just accept self-descriptions at face value? self-described anarchos do everything from stake state subsidies to electoralism to being Charlie Veitch. maybe we should update our intro to libertarian communism to read 'like the USSR but with the Love Police instead of the NKVD'. To get back to actual discussion for a moment, I agree with you that there is a difference between anarcho-syndicalism and revolutionary syndicalism but I disagree with the way you seem to be trying separate them out as one good and one bad. The fact the Spanish CGT describe themselves as anarcho-syndicalist and the USI in Italy affiliated to the IWA describe themselves as revolutionary syndicalists shows that things just aren't clear cut. right, but self-description is no way to understand politics, cf. 'communism' in the USSR etc. i mean the 'red and black co-ordination' calls itself red and black, but its member unions variously take state funds, participate in collaborationist union elections and support electoral candidates. none of those things are meaningfully "anarcho-". if you look at the reasons for the split with the CGT for example, they were precisely revolutionary anarchist principles. the fact they still call themselves anarcho-syndicalists and use the imagery is neither here nor there. i mean of course they do, they were hardly going to rebrand as a reformist class collaborationist union dependent on state patronage. and when you take the anarcho- out of anarcho-syndicalism, you're just left with syndicalism. i think that's the crux of it. i really don't think that's true, and nor do serious studies like Vadim Damier's. a lot of stuff tries to conflate pretty much all syndicalism from the CGT onwards into a single amorphous mass, which i don't think is helpful on shedding any light on the evolution and debates within the tradition (Damier is good on this). I agree that Damier's book is good on describing the various debates and factions within the IWA. This is exactly the point, though: Anarcho-syndicalism has always been diverse and had numerous different strands, which can't be forced into a simplistic binary of true anarcho-syndicalists vs "simple syndicalists" who sell out their principles in order to recruit as many workers as possible. The quote from Maximov doesn't really justify the claim that anarcho-syndicalism is opposed to "one big union." If someone had asked whether he thought the various mass grassroots organizations such as shop committee organizations, grassroots soviets etc should form some sort of federative unity, i think he would have said yes. After all in Jan 1918 he proposed creation of a Russian factory committee congress, a kind of federative unity of factory committees, as a coordinating & planning center for a worker managed economy. So why wouldn't he have favored a federative unity of the factory committees as organizations of struggle? KRAS, at the time Maximov was on its exec committee, was a kind of dual organizationalist organizing, educational, political organization, not a union. In other words KRAS did not project itself as the vehicle of the mass workers movement. I think gaining power for workers means trying to build a grassroots unionist movement that can be a majority force. Despite being an anarcho-syndicalist for 40 years, I don't agree with the concepcion put forth here. It sounds to me like trying to define anarcho-syndicalism as a worldview or ideology rather than as a revolutionary strategy to achieve libertarian socialism. I think it is also inaccurate to define revolutionary syndicalism as "apolitical." this probably needs redrafting. it's half-way between differentiating out the various syndicalist currents and lumping them all in together. when we redrafted this we were planning to do a load more, including different flavours of marxism as well. that's kinda stalled. probably the best thing to do would be to talk about a syndicalist spectrum, with varying degrees of anarchism incorporated into union practice.